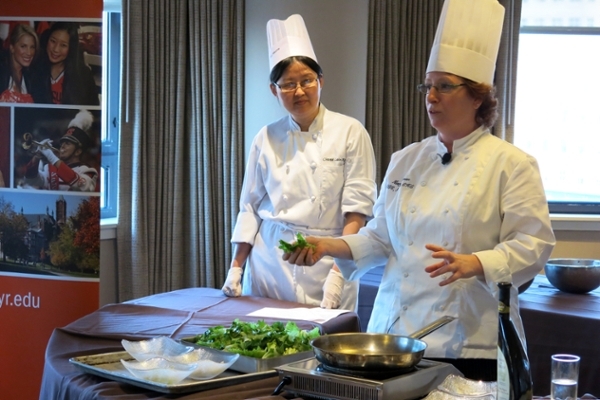 Chef Mary Ann Kiernan, right, talks about the best way to cook escarole for Utica greens during a healthy cooking event in Boston for SU alumni and friends in May. Chef Mary Ann Kiernan calls it “the mystery box of produce.” Every Thursday at this time of year Kiernan and her husband pick up a carton of fresh vegetables at a local health food store, as part of a community-supported agriculture (CSA) program from a nearby farm. But as a nutrition and food studies instructor in the Falk College of Sport and Human Dynamics, Kiernan has seen the trepidation in students as they face a mystifying selection of vegetables. “People are afraid to jump in because they don’t know where to start. It might be intimidating to those who aren’t confident in the kitchen,” Kiernan says. Kiernan will take the fear out of improvising healthy meals with a hands-on cooking class for faculty and staff Sept. 30 from 5:30-8 p.m. in 226 Lyman Hall. Sponsored by the University Wellness Initiative and Healthy Monday Syracuse, the class will combine cooking techniques for vegetables, information on CSAs and how to incorporate meatless meals into a regular diet, along with emphasizing the Mediterranean-style of cooking and eating. Part of the Healthy Monday initiative, Meatless Monday encourages people to eat a more plant-based diet to reduce their saturated fat intake, which can help prevent chronic disease. Kiernan, who teaches a course in restaurant operations, emphasizes simple combinations when struggling with how to pair items. “I teach everybody if it grows together, it goes together. If it all came in that box, then you can’t go too far off,” she says. Recipes need only be a guide. Kiernan might pull a flavor profile from a cookbook or a recipe online, but rarely does she stick to the recipe. With braised beef, she’ll gather herbs and onions and brown the meat before adding liquid, but she finds inspiration from what she has on hand. 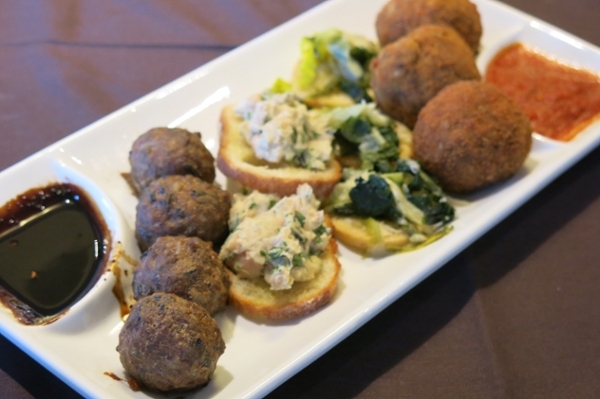 Turkey and wild rice meatballs, white bean dip and Utica greens on crustini and quinoa Arancini is served during a healthy cooking event in Boston for SU alumni and friends. 2 or less portions of meat a week. With these generic guidelines, you can mix with any flavor profile, not just Mediterranean. “It doesn’t have to be olive oil or certain vegetables,” Kiernan says. Kiernan’s class is limited to 20 participants and is available to faculty and staff only. A $25 program fee covers the cost of food. Click here to register for the class. For more information, visit the University Wellness Initiative website at http://wellness.syr.edu or email wellness@syr.edu.